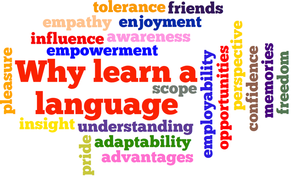 Pupils of all ages and abilities have the opportunity to learn a Modern Foreign Language. All Year 7 and 8 classes study French; Spanish ab initio is offered in Year 8 to Sets 1 & 2. Both languages are offered at GCSE. Most Year 7 pupils have 3 periods of French each week. Some will have one period. In Year 8, pupils in Sets 1 & 2 have 2 periods of French and 2 periods of Spanish. Other pupils have either 3 periods or one period of French per week. Pupils choose their GCSE options at the end of Year 8 and many are encouraged to continue with a language. Year 9 pupils have 4 periods per GCSE each week. Year 10 and 11 pupils have 3 periods per GCSE each week. Students are expected to be challenged and encouraged in their language studies through different activities which focus on the four main skills areas of listening, speaking, reading and writing. There is an emphasis on independent work, pair work and group work. At Key Stage 3, pupils are encouraged to develop communication skills and language-learning skills, including the application of their knowledge of grammar and structures, so that they become increasingly independent learners and users of French. The cultural awareness of our pupils is increased through their study of different countries, and by working with materials from those countries in a variety of contexts. GCSE students develop their understanding of the spoken and written forms of the language and also the ability to communicate effectively in the language. The courses provide suitable foundations for further study and practical use of French or Spanish. ​All students are expected to arrive at lessons with a pen, pencil, ruler and a rubber. Students also require a green ballpoint pen for self assessment tasks and for responding to 'Raising Your Grade' questions. They will also find a small French-English dictionary useful from Year 7 onwards - these can be purchased quite cheaply from various stationery stores and book shops. The Languages Department provides all pupils with an exercise book and a transparent slip-on cover - these should be carefully looked after. Students are allowed to decorate their exercise books with target language/culture specific images before covering them but this is entirely their own decision. Exercise books should be kept neat and tidy and students are expected to present their written work to a very high standard. Each piece of work must have a date and title written in full (in the target language) and both of these should be underlined using a ruler. Work done in class will be indicated in the margin with T de C (Travail de classe) whereas homework will be labelled with the word 'devoirs'.